"SOME NEVER SEE BEYOND THESE WALLS"
"SO LIVE OR DIE CHOOSE THE FORMER OVER LATTER"
Evandr is fortunate enough to be a confirmationally attractive cross between heavy drafts. Every ounce of the brute is thick, from his rectangular visage to his cannon legs. Muscle decorates with and showcases his scars and physique, a wordless warning that the stud doesn't only have some brain but brawn as well. A thin coat runs along his rigged, rugged slopes and curves in the color of a tobiano set upon a dark amaranthine bay. The color of his pelt is not unlike black from a distance, but upon closer inspection one can see the amethyst sheen hidden within the darkness. A steely white lacerates the pitch hue upon his shoulder, visage, and legs. All tresses upon the male are thick, heavy, and hold a disheveled wave to them. With a banner that nearly drags (though is kept from doing so as it is not practical) and tresses that hang in heaps upon his strong shoulders and nape, giving an illusion he's even larger than he already proves to be. They are a black color, although sun has bleached his hair so that they shine with a fiery clear coat. While all of this may seem rather unremarkable for a Spiritborne, Evandr holds his own oddities. More eye catching rows of pointed black and bone spines cover his shoulders, back, and hips. His skin bunches and wrinkles around this bony protrusions, that are glossy and arch backwards. They are not extravagant in size, but they are a fortunate natural protection. Their bases are covered with small knobs, making them somewhat unattractive from close inspection. While he would have been an attractive young suitor, his altercations with both the previous warden, challengers, and more specifically a bear have left him heavil scarred. He is fortunate to have his eyeside, as the right side of his face is mangled and riddled with scarring. While some find the look grotesque, others still can find attractiveness in it. "I CALL MY OWN SHOTS I WON'T SIT IN YOUR THRONE"
Ruthless - First and foremost, Evandr will establish his authority through emphasis of his brutal force. As the Warden, he is not passed killing any offenders to the laws he states for the castaways, and he enforces them without second thought as long as evidence proves the course of action. It is through force and his merciless fighting nature he won his title, and it is how he will remain in power until the end of his days. Though at the core Evandr is truly a good natured stallion, intimidation through sheer physical mass and harsh speech has proven to keep the exiles in line. The stallion is not stupid, and knows how to maintain his authority in the holds of a dog eat dog world. Charming - Though he's rough around the edges, Evandr was at one point a smooth talker - and remains so, both in a political and casual sense. After having to deal with his mother's memory loss for several years, he's come to have a very easy, natural, and inviting way of speech, though the tone is gruff and vocals gravelly. The times he's spent in the company of mares hasn't worn, and he's not passed slipping some sugary words to alter the course of a conversation in his favor. Honest - When Evandr says he is going to do something, he will do it, come Espen or the Bloodless. Local born, he's true to his country despite the hardships he's dealt with at birth. He's unafraid of the consequences he may receive when he promises others, and never will he provide false information to another. The stallion wears his heart on his sleeve, and he'll be the first to assure you of the fact. A pact with him is one you will never question. Some say he goes as far as being brutal with his words, for if he finds your course of action flawed he will inform. "BECOME SWORD UNSHEATHED, CUT RAW"
Not all journeys begin with the smiles affiliated to happy families living prosperously in the holds of the royals; rather, this struggle began with a single mare and her son, Evandr. Adelaide Dresner had been castaway from her position in Ambrosius due to her crazed nature of forgetfulness, causing countless issues while she served her later years in the guard. Having suffered from a severe head injury in a confrontation, her mental handicaps led to a minor incident where her punishment was vastly dire in comparison - complete exile. Ambrosius did not wish to keep the mar in their hold, and away she went, to the far off Vetr Wastelands where she would slowly rot from memory. Attempting to find some comfort in the frigid Wastes, she met a passing stallion and they travelled east together for sometime. Before long, the stallion left to go about his own ways of life, forever a traveling, singular, nomad and Adelaide was once again left to her own vices of wandering. For some time she was a target of groups of stallions who could over power an ex-quard through force, or just the general teasing and taunting of bored youth, but Adelaide was persistent and stepped over her hardships with her own personal strength, and moved onwards. A colt was born late into the summer of the following year. Almost immediately Adelaide's entire focus was the well-being and safety of her newborn son, Evandr. Despite the hardships of growing with little food and water, and constantly on the move as to avoid becoming prey or found by undesirables, Evandr had a primarily average foal-hood, under close scrutiny of his mother when her own handicaps allowed her peace of mind. As he matured, Adelaide brought him closer and closer to the Svartr Lands, as to provide him company around his age and for better security. The young stud colt follied with young mares and quarreled restlessly with his fellow boys for many months without what seemed care, and for some time it seemed that life had taken more of a turn for the better. However, as Evandr grew stronger Adelaide grew weaker. Her mind proved more and more trouble each day, until every morning she found herself surprised by her son's size and age, causing her great distress upon the realization she could hardly remember the last few years. Her duty to the Ambrosius crown and the wrong that had exiled her faded from her memory, and she found herself lost in a haze of constant confusion. Evandr was equally distressed in the beginning of his mother's sudden relapse, and sought comfort in the arms of fillies and mares willing to hear him out and provide him company, though the escapades brought him even further discomfort upon their endings. Soon guilt for leaving his mother behind overwhelmed his own screwed priorities and Evandr tossed aside his time of play for times of strife, and guarded his mother as diligently as Espen did the holds of Ambrosius. ;As exiles grew more and more, the shortage of food and water grew scarce, and Saren - the current Warden of the Castaways - chose to hoard his Oasis for himself and a small harem of mares he kept close. Countlessly fellow exiles heard of tales where their companions would go to him in hopes he would share his plentiful lands, but he cast them back into the wastes, beating them until they swore fealty to him. Many chose to avoid Saren, and attempt to survive on their own, despite their numbers quickly dropping most especially in the elderly. Having hoped that the trip to the oasis would have been his mother's saving grace, the inherent anger Evandr had instilled upon himself already through guilt brooded and festered, until soon he spouted terrible preachings about their Warden, especially to his delinquent and deteriorating mother. He wanted her never to remember the figure from the tales he heard as a colt, where the Warden was idolized as a singular beacon of leadership in the dust beaten wastes. Anger soon turned to motivation, and motivation into action, and Evandr began training diligently as to prepare a confrontation with Saren, and stop the unruly treatment of his fellow peers. Every day Evandr would wake early to strengthen his heart with hard and long gallops around the perimeter they had stayed the night, returning before his mother woke to feed her the past several years of information before they set out for another safe place to rest. As time progressed, he avoided telling her of her ill treatment in Ambrosius, and merely stated she had been lost, and that there was no way for them to return. Adelaide took her son's comforts well though the initial struggle was emotionally ravaging, but quickly Evandr found the proper ways as to approach the subjects, and cause her less and less distress. In time, each morning went seamlessly, and his words soothed every demon that threatened his mother's sanity. As his speech craft developed, so did his body. Muscles upon muscles pulled leathery skin taught, and the already handsome colt had transformed into a powerful stallion. 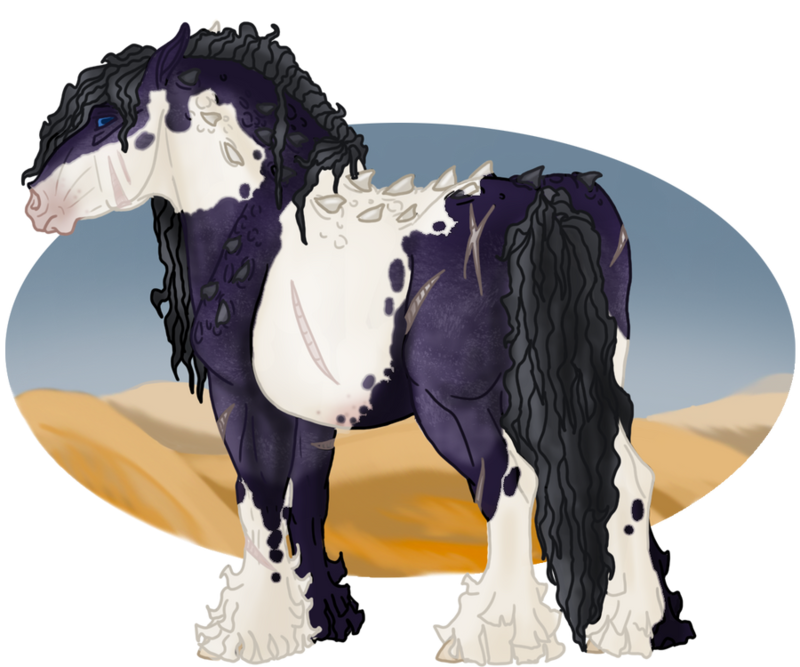 Weaker, feeble equine avoided Evandr's presence while he led his mother through the wastes, though his genuine concern for the castaways' health proved his exterior otherwise, and he became to something of a figure of hope. Rumors of Saren's mistreatment to his "subjects" spread like wildfire. Evander attempted to persuade others to join his cause and to go against Saren, though the weak, tired, and hungry Castaways were not looking at standing against their fit and healthy oppressor. It seemed his efforts were pointless if he could not rally support, and as the days progressed and he continued his training, Evandr grew irritable and unhappy in nature. Stoic and statue-like in his process, days blurred together as he continued to push his mother forward, the last sliver of hope finding her a place to live comfortably around the Svartr lands. As they grew closer to the Oasis through the Wastes, a stallion approached Evandr while he patrolled, seeking inquiry to the mare that he was so obviously guarding. Evandr, bitter, gave a short response, though to his surprise those short few words were all the stud needed. He introduced himself as Seph, an old friend of his mother's, and Evandr's father. He persisted that he were to speak with Adelaide, even if it were briefly, and reluctantly Evandr allowed. Much to the old stallion's dismay, Adelaide for the life of her could not remember Seph's face nor name, though she admitted to it being "slightly familiar, though she didn't know". Evandr led the disheartened Seph a ways away to allow Adelaide space to return to her grazing. Evandr explained the many years of strife his mother had divulged to him throughout the years, and closed with her current state of discomfort due to the harsh treatments of Saren and her mental handicap. A fire burning in his chest, Seph not only encouraged his son's desires for usurping the Warden, but also vowed to see them to the Oasis safely. Protected by two stallions, Evandr explaining to Adelaide each morning that Seph was merely a close family friend to save her further confusion, the trio set off with renewed vigor. Seph was able to help train Evandr further, progressing his combat intelligence rather than strength. As the verdant foliage rose on the horizons, mental preparation began; soon, Evandr would face the tyrannical Warden. Soon, he would be able to provide his mother the comfort she was robbed so unjustly. Upon the outskirts were terrified outcasts, ribs dancing beneath their skin and legs shaking with fatigue, that stared as the massive stallion led a mare not so far off their own health through the flora, along the borders as to not invade into the oasis grounds just yet. Instead, he spent a night with his mother in the wonderful lush lands, celebrating their long journey's finale in the vales of the Skali Mountains, amongst the mountain flowers and grasses. Early the next morning Evandr awoke, and prepared himself with his daily run, returning to his awoken mother, especially happy in comparison to her previous moods. He stressed that she stay here, and that he would return after all of their troubles were solved, and that she should eat to her hearts content. Adelaide bid her son good luck, embraced him, and watched with immense pride as Evandr took to the Oasis. It was as he had imagined, filled with all sorts of green plants good for consumption, but barren save for several other stalking confidants, who merely stared in wide eyed fascination as the much larger stallion strode through at a powerful trot without any sense of caution. Saren was nestled into his paradise as Evandr had hoped, clustered around mares, an old gray sentry in the emerald forest. Forsaking a cautionary warning, Evandr barreled through the mares, Saren only having enough time to meet the younger stallion chest to chest in a rear. The mares scattered as Saren and Evandr tore brutally at one another, while several other hopefuls started materializing from the waterways, bickering amongst themselves - soon, the entire oasis broke out into combat. Stallions against stallions, Evandr only focused on Saren. Three other studs joined into their personal fray after chasing off the smaller and weaker counterparts, the clutch of muscle and sinew tearing apart the pristine grounds as bodies shoved, fell, and tore. Blood oozed into the refreshing water, as wales from the onlooking harem sounded on the limits of the fight. Destroyed by four opponents, Saren fell beneath Evandr's hooves, soon the other stallions who had hoped to steal his victory from him as well. Nothing would stop him from claiming what he had worked so hard to achieve. Beaten to scarring, Evandr turned to the harem mares and demanded through labored breath that they collect the castaways from the surrounding areas to come to the council of their new Warden. As they trickled away after kneeling to their new protector, Evandr returned as quickly as possible to the location he'd left his mother to find only vacant, beautiful fields and the whispers of a mountain's solitude. Searching desperately he found to his horror a young black bear dragging away the remains of an equine leg, too closely resembling Adelaide's own. All of his motivation had been driven to protect his mother, and in one fatal mistake to keep her away from the fray and in the divine's hands, he had failed her. Despite the protest of his limbs the stallion dove down onto the black bear, nor more his size if the predator was lucky. Without mercy the stallion beat his hooves repeatedly at the dense black fur, the bears claws reaping their lacerations but drawing no yield. Evandr's own squeals of pain were soon joined by the feverish calls of a distressed bear. The collection of castaways that had already congregated among the oasis listened in horror, as after some time the cries fell quiet the the forest stilled. Murmurs whispered amongst the gathering about what was to be done now that the new Warden had fallen. None had expected to witness the brutish stud come limping through the trees, the right side of his face a bloodied mess, more horrifying looking than he had been only some time earlier. Out of sheer respect none of them challenged the bloodied mess that was an equine, and instead listened as he told them promises of a better life, that they were all welcome to the oasis and mountains for their fill of meal and drink, so that they did not have to remain in the barrens as his mother did, and that he solely would provide them a life that they were denied by the houses. The skeptical grew excited, and with the small collection convinced, he again sent them upon their way to spread the news of the transgression. In time, Evandr healed, scar riddled and heart broken, but still he remained faithful to the promise he had instilled to his mother - the exiles would have a better life, free of the tyranny from Saren, and it did improve for those willing to come to the oasis. Not all were convinced and came to the beck and call of their Warden, but Evandr had not expected as much from them; to think a young stallion had defeated the Warden and claimed the position could be rumor. Though, as the years have progressed, and now the dramatics of the houses have leaked into the Wastelands from the newly exiled, all know the presence of the scarred Warden. They all know to not cross their ruthless protector, Evandr. "LEARN TO TAKE RISK SO REWARD CAN COME AFTER"
Geokinesis: Elemental of earth, controller of terra, manipulator of stone. Evandr will come to command the very earth beneath his hooves; sand, dirt, stone, and gravel sway to his very call. Apprentice: The ground shifts and tremors at his command. He can will small clumps to rise, fall, and toss. There isn't much power swelling in these new arcana muscles, but it's enough to start. Adept: No longer as taxing, Evandr can control all that is earthly with mild effort, and at greater scale. He can mold them into simple shapes now to suit his needs, and he can use them as projectiles with greater accuracy. Master: It is effortless for Evandr to will the very ground at his feet. His control has swelled with such prowess dust and even lava now swoon into his embrace. There is not as adept control there, but it does bend to his will. Virtuoso:The term effortless reaches a new level. Dust, magma, earth, sand... all of it falls into the stallion's compass. No longer are their physical signs while he harnesses his arcana. Formidable is he, and despair those who anger the stallion at this level of expertise. "TIME TO FACE THE DRAGON AS IT BREWS YOUR DISASTER"
Zahhak the Earth Wyrm Living Myth - There is no better beast suited for the desert than the mighty wingless drake bonded to the Warden. This quadrupedal monster stands at the same heights as the tallest half-giants, though is nearly thrice as long. Comprised of hard plates and scales that slope and weave about him aerodynamically, they lay about his long nape in a reminiscent way of a cobra - fanning to the sides and slopping back behind the crown. Impressive horns curl and protrude from his face in several facets - from the ones that scope outwards and up along his jowls to the protrusions along his upper lid, there is little to Zahhak's dorsal that could be described as "smooth". His ventral, however, where the sand-hued underbelly lay is much again like that of a snake. It is glossy, smooth, but strong, minus two chest plates that angle and protect his most vital organ: his heart. Dark burgundies, sharp umbers, terra cotta, and wheat paint this beast in an undulating roll that both invokes fear and blends him into the East's remote mountains. And while Zahhak may appear much like those summits on the horizon, it is far from his natural habitat. The beast moves by slipping across the sands, his underbelly almost unable to leave the ground. His four legs and their webbed between his double clawed (true, prehensile-webbed claws and a pseudo-pair of crude plate growth) are much like that of a lizards: they drag him along the surface of the sand, but more importantly they dig. Zahhak's primary motion of travel is by "swimming" through the sands. With powerful forearms and perfect conformation to command heavy heaps of sand, this wyrm uses his aerodynamic build not to fly but to adeptly navigate below the dunes; a desert shark and the head of the wasteland's food chain. Additionally, the thickness of his scales withstands the Vulkan Lands lava pools for as long as the beast can hold its breath. Those who do not run from his arrival find a quiet and brooding giant. A stunted male juvenile, Zahhak finds kinship among the horses rather than prey. At least, those that Evandr declares are not edible. He finds great purpose in serving as the Exiles massive guardian, for his piercing cry can be heard for miles.